Things to do with eggs! I am fascinated by the versatility of eggs. They are sometimes the only substantial thing I have in my fridge, and I am always looking for new ways to use them. So here is a list of eggy delights! Yesterday was a lovely Sunday morning, and I woke up knowing I had a busy day ahead. I had a dance rehearsal at midday, after which I was heading to Cambridge for a garden party with my fellow blogger, the Baking Medic. I therefore wanted to eat something that would sustain me until about 3pm, when I would be gorging myself on barbecued goods, strawberries and cream and ice cream. These scrambled eggs with a twist were a perfect start to my day! Whisk the eggs together with the milk, salt, pepper and chilli powder (chilli is the secret ingredient to making good eggs – this is what my grandmother taught me). Add the bacon, along with the cheese. Heat some olive oil in a small pan and pour in the mixture, scrambling it until you are happy with the texture. I like my eggs well cooked, but they work equally well runny. This is a simple, quick and delicious recipe for those mornings when you need something more than just a bowl of cereal! Now that the weather is getting warmer, I do like having a salad in the evening. 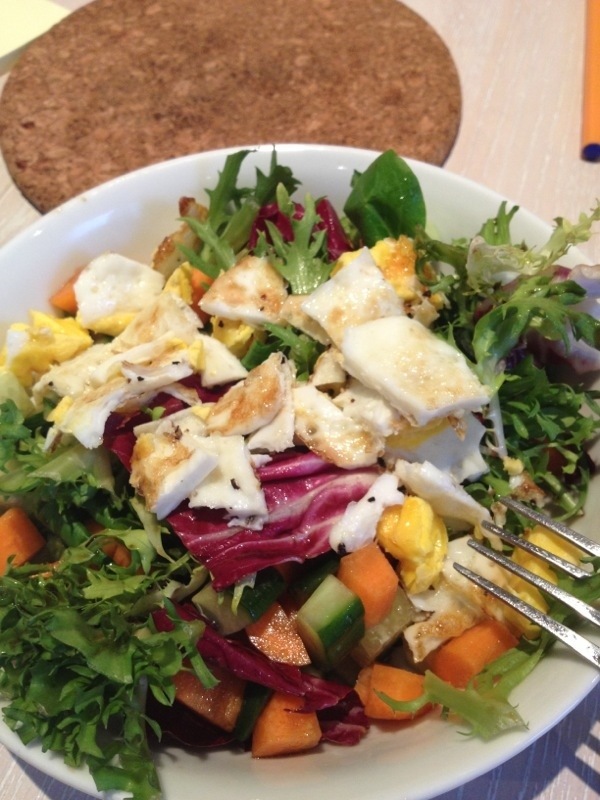 I made this salad the other day, and I decided to add a fried egg on top as it added flavour, colour and protein. Basically, mix everything in a bowl except the egg. Heat some olive oil in a pan and crack the egg into it. Once it is cooked on one side, sprinkle some salt, pepper and chilli powder on it and then flip it over and cook for another couple of minutes. I think it’s best to cook it on both sides so the yolk doesn’t run all over your salad (unless you like it that way). Once the egg is done, sprinkle salt, pepper and chilli powder on the second side, chop it (either with scissors, or fork and knife on a cutting board) and add it on top of the salad. My boyfriend LOVES eggs. Eggs are a pretty awesome ingredient. We love to do the fried egg on salad thing, but we just put the entire egg on and let the yolk run as our salad dressing. It’s so yummy!